September 20, 2012 - The Federal Aviation Administration (FAA) announced a significant step forward in its Next Generation Air Transportation System (NextGen) programs, awarding a contract that will supplement the voice communications currently used in commercial aviation with a digital system for clearer, more efficient communication between air traffic controllers, the flight deck and pilots. The FAA selected Harris Corporation Government Communications Systems to provide Data Communications Integrated Services (DCIS), with a subcontracting team that includes ARINC Inc., GE Aviation and Thales. “The FAA’s commitment to Data Communications is a critical next step for improving air safety, reducing delays, increasing fuel savings and improving the environment,” said Acting Administrator Michael P. Huerta. “When fully implemented, DataComm will make work safer and more efficient for both the air traffic controller and the pilot.” Voice communication is currently the primary means of relaying information in air traffic management. However, voice communication is not the most effective way for air traffic controllers and pilots to communicate because it can be time-consuming and limiting. DataComm supplements today’s analog voice-only air-to-ground communications system with a digital system, and it will become the primary mode of communication in air traffic in the future. DataComm will provide a two-way data exchange between controllers and flight crews for clearances, instructions, advisories, flight crew requests and reports. It will enhance air traffic safety by allowing controllers to give more timely and effective clearances, and more reliable messages to reduce the risk of incidents associated with voice communications. It will also help air traffic controllers safely handle more traffic by reducing congestion on radio frequencies and related errors. 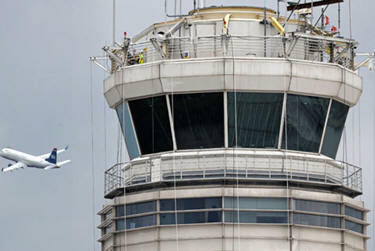 The FAA will deploy data communications in air traffic control towers by 2016 and in air traffic facilities that manage high altitude traffic beginning in 2019. The $331 million contract covers seven years, with 10 additional one-year options. Harris Corporation will also be responsible for contracting directly with communication service providers to establish Data Communications Network Services.